His lab researches eggs. His primary research interest is to understand the links between egg and health, and further process egg into value-added functional foods/nutraceuticals. 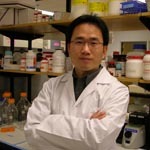 More specifically, his research focuses on protein/bioactive peptide preparation, purification, characterization, and bioactivity evaluation using chemical methods, cell culture and animal models. Research on developing protein-based biomaterials from agriculture byproducts and wastes is another area of interest.